Thousands gathered Tuesday in New York, suburban Washington and rural Pennsylvania to mark the 11th anniversary of the Sept. 11 attacks. NBC's Ron Allen reports. Thousands gathered Tuesday in New York, suburban Washington and rural Pennsylvania to mark the 11th anniversary of the Sept. 11 attacks, but at the somber day's biggest venue, Ground Zero in lower Manhattan, this year's observance was missing a key feature from years past: politicians' voices. In a reminder of the global consequences of the attacks, in which nearly 3,000 people were killed by airliners hijacked by Islamist militants, commemorations also were being held abroad. At the Kaia airport in the Afghan capital Kabul, soldiers with the NATO-led International Security Assistance Force prayed during a memorial ceremony for the Sept. 11 victims. The United States and its allies launched the invasion of Afghanistan to oust al-Qaida and its Taliban protectors in retaliation for the 2001 attacks. Nearly eleven years later, troops are still fighting there in what has become America's longest war. President Barack Obama has pledged to end the main U.S. combat role in Afghanistan by the end of 2014, but current plans call for some thousands of U.S. troops to remain long after that to train Afghans and hunt terrorists. Since 2001, more than 2,000 American troops have been killed in Afghanistan. In previous years, politicians including presidents, state governors and New York City mayors have participated in the reading of the names, or have read from the Bible or recited passages from literature, at Ground Zero commemoration ceremonies. The nation pauses in honor of the spirit and sacrifice made by the victims of the September 11th attacks in ceremonies at Ground Zero, Shanksville and the Pentagon. NBC's Danielle Leigh reports. This year, only the families of the more than 2,750 who were killed when militant Islamist hijackers crashed two jetliners into the World Trade Center's Twin Towers, causing their collapse, appeared on the podium to read their names. To Charles G. Wolf, it's a fitting transition. "We've gone past that deep, collective public grief," says Wolf, whose wife, Katherine, was killed at the trade center. "And the fact that the politicians will not be involved, to me, makes it more intimate, for the families. ... That's the way that it can be now." Fewer families attended the ceremonies this year, and some cities canceled their remembrances altogether. The president and first lady observe a moment of silence on the White House font lawn in honor of the September 11 attacks. "I feel much more relaxed" this year, said Jane Pollicino, who came to Ground Zero Tuesday morning to remember her husband, who was killed at the trade center. "After the ninth anniversary, that next day, you started building up to the 10th year. This feels a lot different, in that regard. It's another anniversary that we can commemorate in a calmer way, without that 10-year pressure." Politicians still attended, but under event rules set down in July by the National September 11 Memorial and Museum, chaired by New York Mayor Michael Bloomberg, none was to speak or participate in the reading of names. The point, memorial President Joe Daniels said, was "honoring the victims and their families in a way free of politics" in an election year. Homeland Security Secretary Janet Napolitano was among the officials attending the New York ceremony this year. But others said keeping politicians off the rostrum smacked of ... politics. The move came amid friction between the memorial foundation and the governors of New York and New Jersey over financing for the museum — friction that abruptly subsided Monday, when Bloomberg and New York Gov. Andrew Cuomo announced an agreement that paves the way for finishing the $700 million project "as soon as practicable." Before the deal, Cuomo, a Democrat, and New Jersey Gov. Chris Christie, a Republican, had signaled their displeasure by calling on federal officials to give the memorial a financial and technical hand. Some victims' relatives saw the no-politicians anniversary ceremony as retaliation. "Banning the governors of New York and New Jersey from speaking is the ultimate political decision," said one relatives' group, led by retired Deputy Fire Chief Jim Riches. His firefighter son and namesake was killed responding to the burning World Trade Center. Spokesmen for Christie and Cuomo said the governors were fine with the memorial organizers' decision. The restrictions will not extend to politicians at the other remembrances. 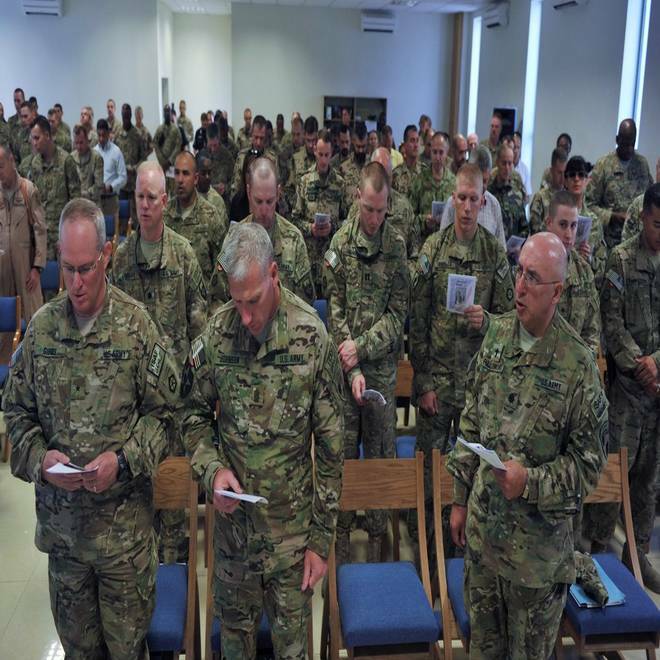 Soldiers with the NATO-led International Security Assistance Force pray at Kaia airport, Kabul, Afghanistan, during an 11th anniversary memorial ceremony for those who perished in the Sept. 11 attacks in the United States. At the Pentagon outside of Washington, where more than 180 were killed when a hijacked plane was flown into it, Defense Secretary Leon Panetta spoke in a ceremony that was closed to the public, attended only by victims' families. Obama said that the whole country shares their loss. "Eleven times we have paused in remembrance and reflection, in unity and in purpose," Obama said. "This is never an easy day, but it is especially difficult for all of you, the families of nearly 3,000 innocents who lost their lives." "But no matter how many years pass, no matter how many times we come together on this hallowed ground, know this: That you will never be alone, your loved ones will never be forgotten. They will endure in the hearts of our nation because through their sacrifice they helped us make the America we are today, an America that has emerged even stronger." Earlier, the president and first lady Michelle Obama observed the anniversary in a ceremony on the White House's south lawn, and then laid a white floral wreath at the Pentagon, above a concrete slab that said "Sept. 11, 2001 — 9:37 a.m."
Vice President Joe Biden and Secretary of the Interior Ken Salazar delivered remarks in Shanksville, Pa., where 40 passengers aboard United Flight 93 were killed when that plane crashed as they revolted against their hijackers. The names of 40 crew members and passengers aboard the plane were read beginning at 10:03, the time of the crash, by victims' families and local volunteers who assisted in the aftermath of the attacks. A bell was rung for each of the 40 victims, and a wreath was laid at the Wall of Names honoring the dead. "How we handle the legacy of these 40 people and what they did, what they kept from happening, is really more of a statement about ourselves, about what we value as a society," said Patrick White, current president of Families of Flight 93. White's cousin, Joey Nacke II, was among the passengers who stormed the cockpit. U.S. authorities say the al-Qaida hijackers planned to crash that plane into the U.S. Capitol in Washington. The anniversary led to a brief pause in the presidential campaign as Obama and Republican challenger Mitt Romney pulled their negative ads and avoided campaign rallies. Romney shook hands with firefighters at Chicago's O'Hare Airport and was flying to Nevada to address the National Guard, whose members deployed after the attacks. His running mate, Rep. Paul Ryan of Wisconsin, had no scheduled public events. Caitlin Leavey, who lost her father in the September 11th attacks, speaks out on how she found a way to cope and help other victims of terrorism. WNBC's Erika Tarantal reports.